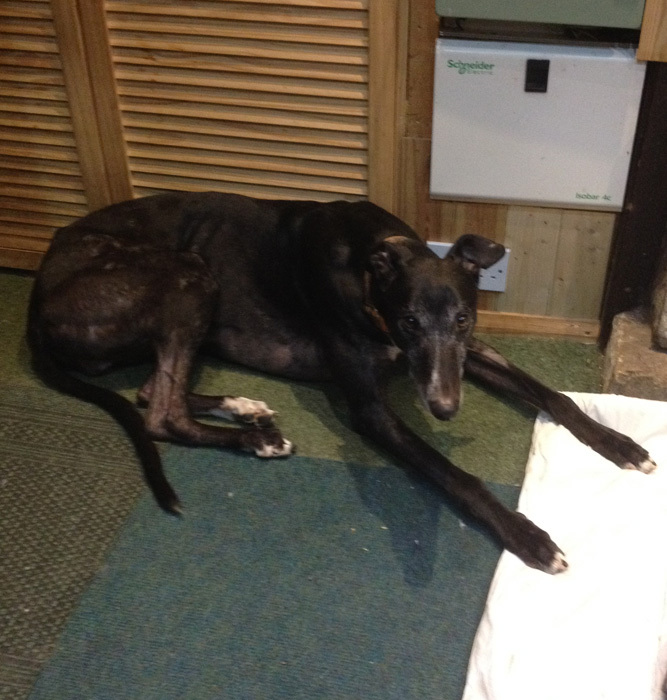 Went to his new home on Sunday 13th November 2016.
without another greyhound for a companion especially when his owners were out. Seve went to live with Winnie on Tuesday 27th December 2016. All was well to begin with until Winnie decided she didn't want Seve as a companion so he was returned on Sunday 15th January 2017. Went to his forever home on Thursday 11th May 2017. Seve is a super black ex-racing greyhound who was born in April 2012 and weighs 37.4kg. 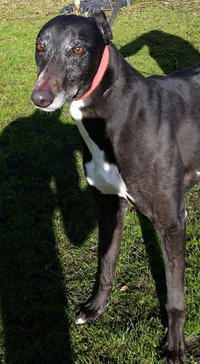 He was born in the racing kennels and after he'd finished racing he remained there for 2 years waiting for a place in a rescue centre until he came here. 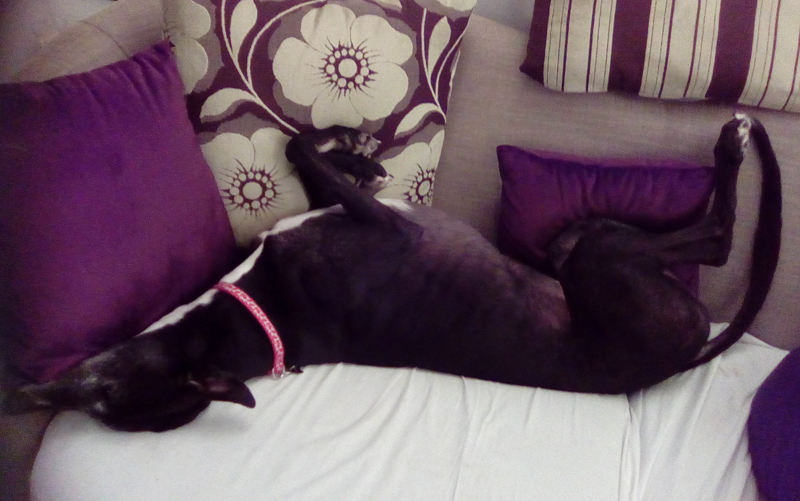 Seve is house trained, neutered, inoculated and microchipped. When he arrived he missed his kennel mate at night and wimpered until Katie on the third night joined him and he settled. Seve was apparently the one the other pups in the litter tended to bully and he enjoys companionship. He is a very happy, playful lad who loves being kissed and cuddled and will give you kisses back. He's super on the lead, loves meeting people, is okay with other breeds of dogs and children, travels well in a car, but can become frightened if he's left on his own in the house hence us wanting to find him a home where he won't be left on his own, or one with a companion he can live with. Seve went to the vets this morning for his dental where he weighed in at 35.8kg. He had 2 teeth removed, a molar and a pre-molar, and the rest were cleaned and scaled. The nurse said as he was resting after the operation his tail was wagging at her even though at the time he was unable to stand. She said they don't get that often so it was nice to see. When we got him home late afternoon he was still a bit wobbly when standing and his back end kept dropping where his legs couldn't hold his weight. Would he lie down though - no he wouldn't and he was a bit on the grumpy side so we just lay a duvet in front of him and left him to it. He eventually lay on the duvet and went to sleep where he looked a lot more comfortable. Later in the evening his eyes said he was hungry so we made him some food which he really enjoyed, then he settled for the night. This morning Seve looked more like himself and enjoyed his breakfast which, like last night we soaked and included his antibiotic. He's a real 'licker' is Seve and if you get your face too near him be warned he will lick you if he can. A couple called in this afternoon to look at the dogs and were really taken with Seve who thought the gentleman tasted lovely because everytime he got the opportunity he licked him. It was so funny to watch. On the way out they asked if they could reserve him and are coming to adopt him in a week's time after he's finished his antibiotics and they have everything ready for him. This morning our bed and breakfast guests who reserved Seve a couple of weeks ago took him out for the day in their car with Summer their other greyhound to see how things went. They went to Walney Island, visited the surrounding area and had an afternoon tea on the way back - Seve enjoyed that! Back home about 4.15 pm and he was back with us, and the report back was he'd been very good. He had his dinner then back up the bank to the balcony of Room 1 to say hello to his new family who were in that room. This morning after our guests finished breakfast and packed their bags ready to go home they came into the conseratory to complete Seve's adoption paperwork and take him home with them. He gave them a lovely greeting, had his breakfast, went in the garden then walked off with them to their car with Summer and off to his new home where we hope he will have a long and happy life. We received a phone call today to let us know Seve is settling in well. He can now go up and down the stairs okay and he's found the settee, which he loves.